In 2008, Ariella Azoulay published The Civil Contract of Photography, defending the photograph as an eternal open medium through which people past and present can encounter one another on equal terms. This is accomplished through a profound rethinking of political theories of civil rights and theories of photography. After this major study, the author is now once again advocating civil encounters “beyond hegemonic discourse” through and with photographs—in particular with photographs resulting from unequal power relations. 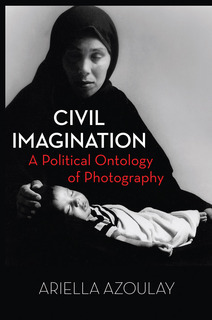 Azoulay’s latest book called Civil Imagination: A Political Ontology of Photography (2012), is mostly based on lectures on aesthetics and politics. 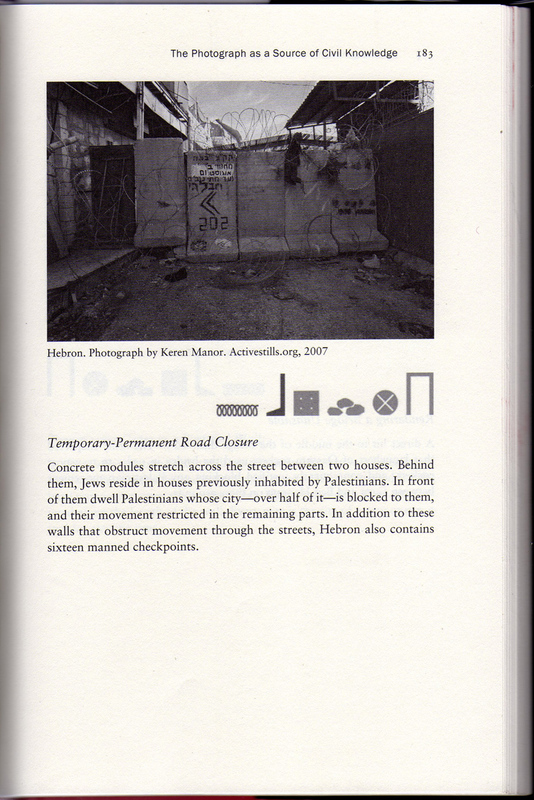 One chapter offers a visual essay based on the exhibition “The Architecture of Destruction” (Zochrot Gallery, Tel Aviv, 2008), classifying house demolitions and blockades in Israel and the occupied territories. The four chapters do have some underlying propositions, however this book is not as coherent as The Civil Contract of Photography. In my review of that lengthy, difficult, yet important book, I spoke about my hope for a shorter and more accessible study of the central arguments dealing with a “citizenry of photography”. In my mind, becoming aware of one’s role as citizen in this citizenry could lead us, for one, to understand photographs different from canonical discourse; moreover, to engage in encounters through photography on more equal terms, within that framework of the imagined citizenry. Albeit more concise, Civil Imagination is not the book I had hoped for. The language Azoulay employs, is largely derived from, or based on, legislative discourse. Many sentences are strenuously formulated. In particular the longest essay by far, called “Rethinking the Political”, is complex and full of repetition. In it’s confusing composition, it doesn’t seem to have been well re-edited from lecture to essay. Azoulay draws on theories of Walter Benjamin and Hannah Arendt among others, as well as on philosophies of aesthetics and of politics, including abstract concepts like (judgments of) taste, visual culture, the image, the spectator, and the gaze. The author thus establishes a theory based on her apparent wish to connect an ontology of the political with a new kind of discourse on photography—one in which we focus on things “constituted between people” rather than on hierarchical relationships where sovereignty guides how we live together and how we judge one another. The use of the term “ontology” might lead to contradiction, as ontology points to states of affairs that by virtue of their very existence and presence are exempt from any justification. In other words, ontologies are descriptions of that which is fixed, of that which seeks to stabilize and confirm power. Azoulay, in contrast, argues in favour of open encounters where no sovereign power exists. A new understanding of photography and civil usage of photographs should lead to a democratic community of responsible participants ungoverned by a sovereign power. A democracy of politics and images in which pluralities of gazes and interpretations govern encounters is the ideal. And the encounter is one of the key concepts connecting the realms of photography and politics. The political as understood by Azoulay is “a space of relations between people who are exposed to one another in public”, and she analyses photography (as an abstract category) as “one of the manifestations of this space”. Still, it proves very useful to distil outlines for new theories and ethics on photography from Azoulay’s accounts since they convey a sense of urgency, not least because she writes from a vantage point amidst the pressing political issues of the ongoing Israeli-Palestinian conflict. The most original contribution to Civil Imagination is the third chapter, a large part of which is a “visual essay” on architectural destruction and blockades that restrict the lives and movement of Palestinians, who in Israel or the occupied territories are considered second-class citizens at best and stateless refugees at worst. Plain photographs of demolition and the “architecture of separation” (road blocks, fences, walls, concrete cubes, etc.) are accompanied by extensive captions informing us about what we see—and are including us in the citizenry of photography, trying to make us educated and well-informed citizens. Surprisingly, the photographs are also accompanied by pictograms “serving as a legend for interpreting additional spatial interventions on the part of the occupying regime”. The separations constructed here are intended to not only separate the bodies but also the gazes of Jewish-Israelis and of Palestinians. The photos of blockage form visual examples of everything that Azoulay’s approach to photography and civil society is not. Notwithstanding its difficulties and shortcomings, Civil Imagination is full of compelling ideas and arguments. In particular, I deem the distinctions between the photographed event (one encounter producing a photograph) and the event of photography (an endless number of possible encounters between the photograph and its viewers) to be fruitful for further exploration. Translated from Hebrew into English by Louise Bethlehem. Verso Books, London 2012. 277 pages, 16 x 24 cm, numerous b/w illustrations.